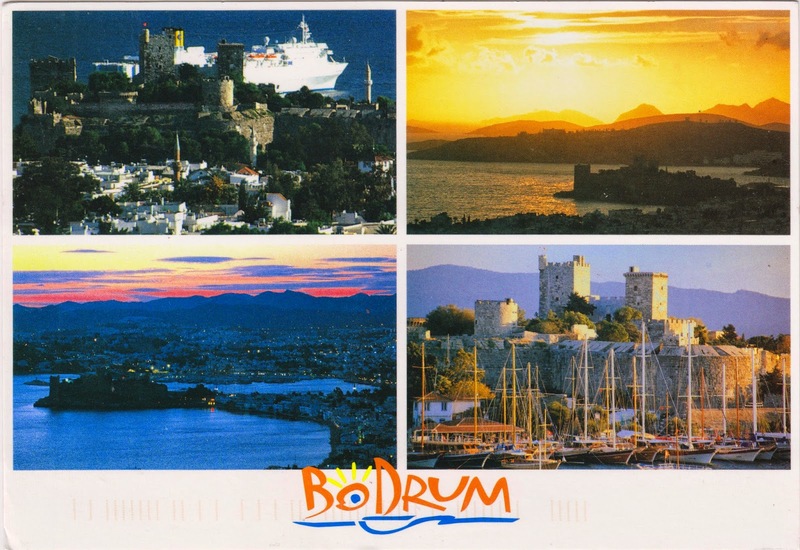 Postcard TR-220335 from Turkey shows multiple views of Bodrum, a port city with 36,317 residents as of 1012 in Muğla Province, Turkey. Located on the southern coast of Bodrum Peninsula, the city was known as Halicarnassus of Caria in ancient times and was famous for the Mausoleum of Mausolus, a tomb built between 353 and 350 B.C.E. for Mausolus, a governor in the Persian Empire. Bodrum Castle, built by the Knights of St John of Rhodes in the 15th century who had used the stones from the tomb to reinforce the castle walls where sections of polished marble from the tomb are still visible today. As seen on the card, the castle overlooks the harbor and the marina, with the Museum of Underwater Archeology on its ground.